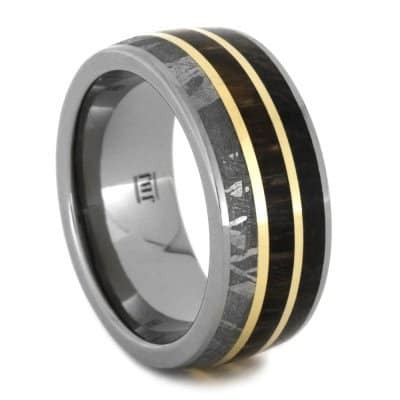 There are a number of stunning inlays for wooden wedding rings out there, but sometimes you have to look for them. In this article, we show off a number of types of inlays we love, and some places where you can get them. Types of inlays we look at here include: Amber, Amethyst, Chrysocolla, Citrine, Coral, Dino Bone, Garnet, Granite, Goldstone, Jade, Larimar, and Lapis Lazuli. 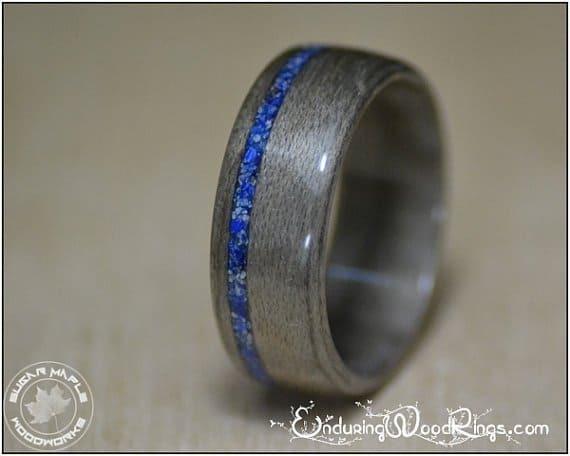 This stunning inlay is a form of fossilized tree resin, though it shouldn’t be confused with sap. Amber comes in a wide array of colors but the most popular and common form of amber varies from a dark yellow to orange hue. 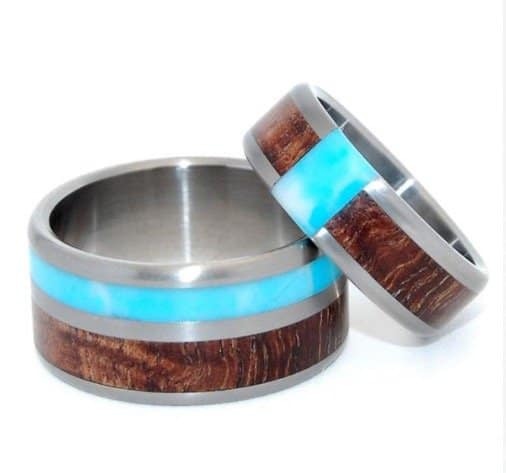 Ambers warm and earthy hues pair beautifully with walnut and cherry wood. Amethyst is an astounding variety of quartz and is most popular in purple tones that range from a light violet to a deep royal shade of purple. Though most popular in purple tones, white amethyst is also a popular alternative to traditional diamonds! To read more about this stunning gemstone, visit our extensive directory of gemstones. 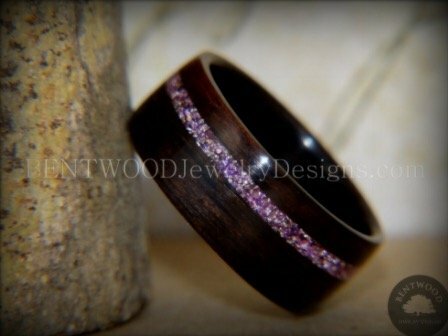 Though the pairing possibilities are endless, we love the way purple amethyst pairs with ebony! Chrysocolla is a mineral that naturally displays shades of blue and aqua. Chrysocolla is an opaque stone offering no transparency. 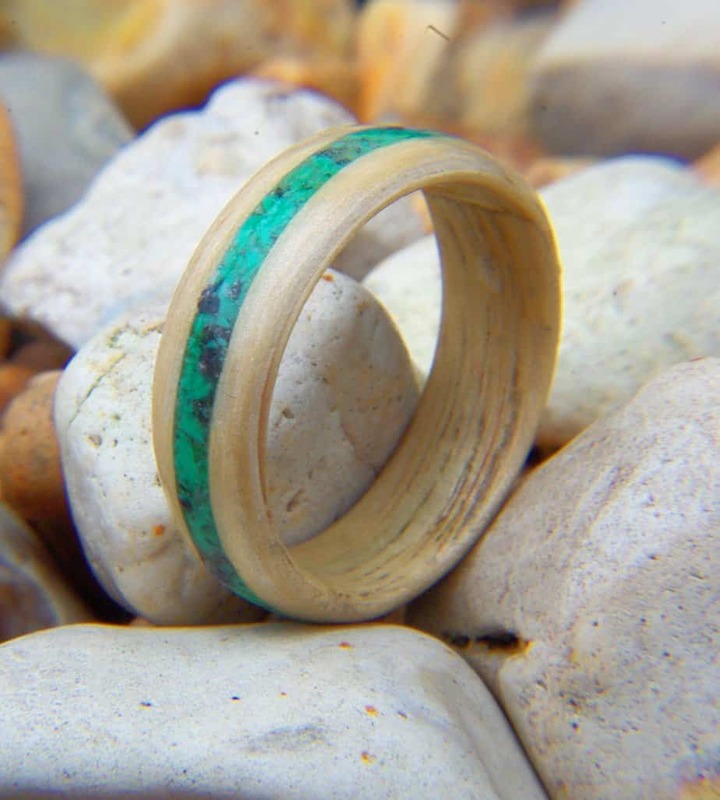 Chrysocolla isn’t a very durable inlay so it is extremely important that it is protected by a sturdy wood – we personally love the way this stunning mineral pairs with the warmth and evenness of oak. Citrine is a stunning yellow colored quartz whose transparency and luster resemble glass. Unfortunately this stunning quartz is extremely rare and, as a result, is often marked as Citrine but is actually heat treated Amethyst – if you are in the market for a wooden ring with Citrine, we highly urge that you purchase your ring from a highly reputed jeweler. Due to its rarity, this gemstone is hard to find as a wood inlay, though we believe that it would pair extremely well with teakwood. The coral used for jewelry and inlays goes by the name precious coral or marine coral. Coral isn’t a mineral or a stone, rather, this stunning pink/red colored inlay comes from the uniquely colored skeleton of the coral. Coral isn’t very durable so it is recommended to pair it with a reliable and durable wood – we love the way this vivacious inlay looks with light colored wood like white oak. Dinosaur bone is a popular form of a broader variety of fossilized and mineralized bones called gembones. Gembones are bone fossils that have formed crystal structures around the cells of the bones. Dino bone comes in a variety of shades but is most commonly found as an opaque piece littered with black and brown splotches and heavily undertones with varying hues of red. 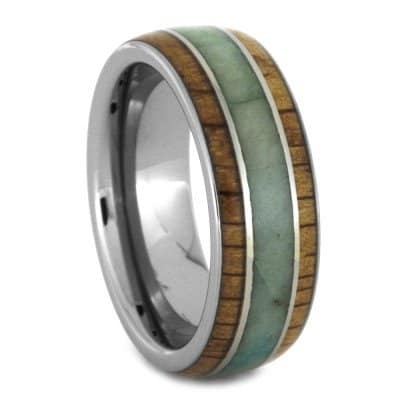 We find that the recycled aspects of petrified wood make for a beautiful and organic compliment to dinosaur bone. Garnet is a popular form of gemstones that comes in a wide array of shapes, colors and sizes. Garnet is a great choice for an inlay due to its strength and durability, falling at an 8.5 on the Mohs Hardness scale. If you are interested in learning more about this beautiful gem, you can find more information in our extensive directory of gemstones. 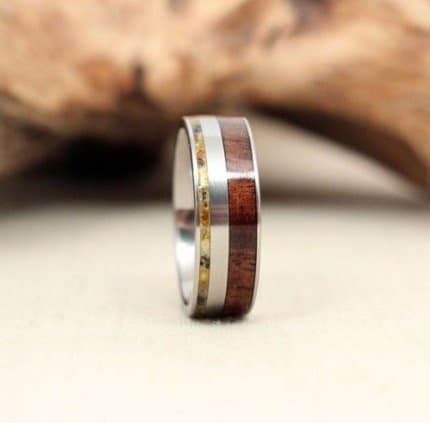 Due to its versatility, Garnet can be paired with an array of woods, but we love the intensity and symbolism found when it is paired with beautiful birchwood. Normally when you hear granite, you mentally think of countertops, right? Well, it’s time to change that thought process. 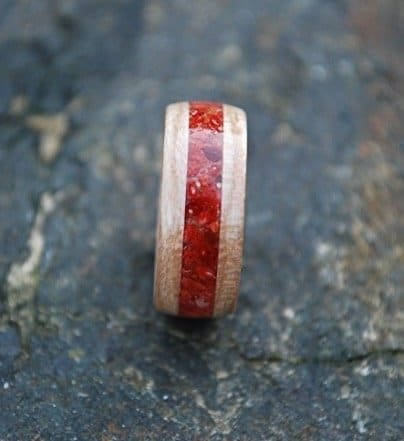 This beautiful stone, made up of 20% quartz, also makes for a stunning, unique and durable inlay for an array of wooden wedding and engagement bands. 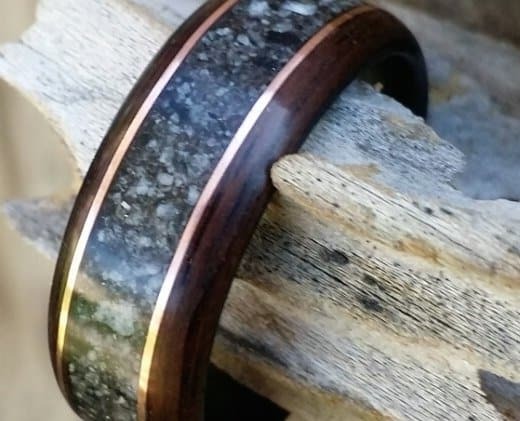 Granite comes in a limitless number of color combinations and the pairing opportunities are endless, but we’re loving this classic combination of granite and ebony! 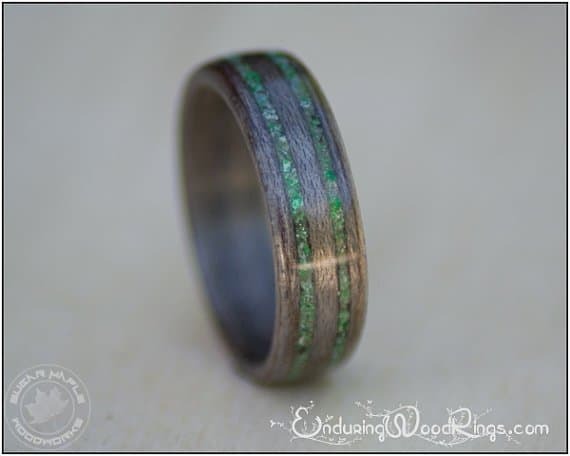 We found this one over on Etsy where it is available – and its stunning! The name goldstone is misleading because goldstone is neither gold or stone. Goldstone is actually a glass whose translucence and unique colors make it resemble a gemstone. Goldstone typically comes in two forms: neutral brown with copper specks throughout or modern green blue or purple undertoned with specks of silver. 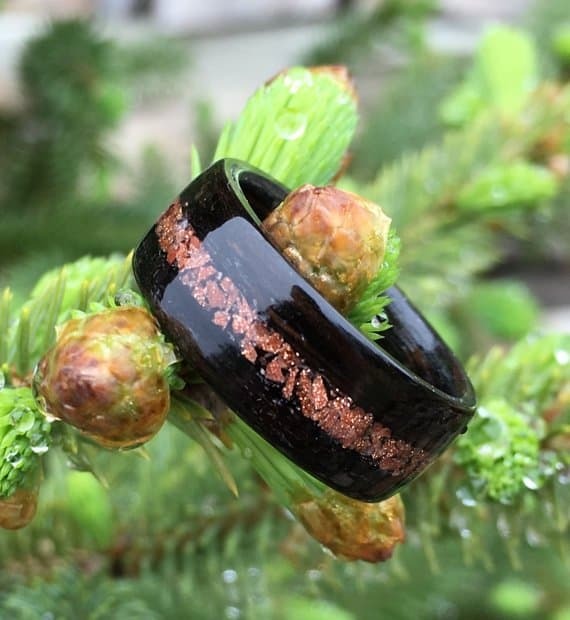 We can’t help but fall all over ourselves with the beauty in the contrast between goldstone and ebony! Jade is an extremely durable, unique and beautiful rock that comes in varying degrees of green. This ornamental rock has an impressive luminescence to it and an intrinsic ability to wonderfully scatter the light that it takes in. Though the degrees of green found in Jade are numerous, the most popular forms of Jade will be either forest green or dark olive. Jade is a beautiful stone that would pair well with a variety of woods, but this jade and grey maple combination is a work of earthy extravagance! Lapis Lazuli is a unique semi-precious stone with degrees of color that vary from light blue to purple and possess illuminating white undertones. Though this stone is undoubtedly stunning, it lacks durability and must have the protection of a durable wood when used as an inlay. 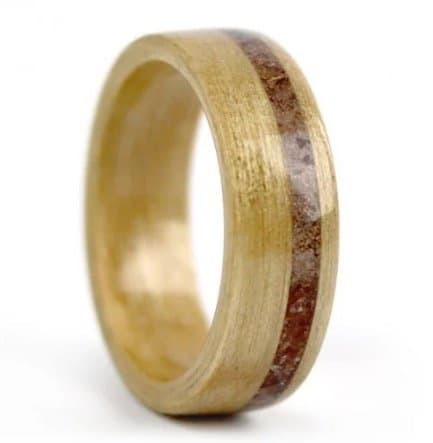 We love the way this unique stone pairs with grey maple to put a modern twist on the wooden wedding ring.